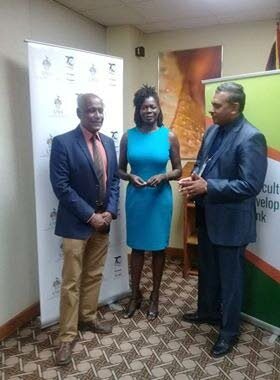 CONFERENCE CHAT: University of the West Indies (UWI) Dean of Faculty of Food and Agriculture Dr Wayne Ganpat (left) chats with UWI lecturer human nutrition and dietetics Dr Marquitta Webb (centre) and Agricultural Development Bank (ADB) CEO Sheivan Ramnath following a media conference Wednesday at ADB's offices, Port of Spain. DEAN of the Faculty of Food and Agriculture at the University of the West Indies Dr Wayne Ganpat says this country has been known for its excessive use of synthetic fertilisers and pesticides in farming but the usage has fallen over the years. the Agricultural Development Bank (ADB), Port of Spain. The conference will be held from November 12-16 at the Radisson Hotel, Port of Spain, and the ADB is the main sponsor. Ganpat said among all the regions in the world to use synthetic fertilisers and inorganic pesticides, it is fairly well established that farmers in TT use them a lot. He said this is because the country is able to produce fertilisers at lower costs than elsewhere and a lot of pesticides are imported. He added around the 2000s the use of synthetic fertilisers and pesticides became an international issue because of the impact on human health. and the region, were taught how to drastically reduce the use of synthetic fertilisers and pesticides. Ganpat said he did not have statistics on hand on the reduction, but anecdotal evidence shows farmers were more sensitised to using safe pesticides such as neem and moringa and were using more composted material for fertilisers. The topics to be addressed at the conference are: food and nutrition security, climate-smart agriculture, agro-ecological systems, and managing plant and animal health. The conference is timely, he said, as climate change is a pressing issue facing the world and the Caribbean region. and the minister would have been busy. Policy briefs would be produced from the symposium and the upcoming conference, he said, to be sent to governments and major stakeholders. ADB CEO Sheivan Ramnath said climate change was upon the country and everyone must be ready for it, not only in terms of academic research but practitioners as well. Reply to "Synthetic fertilisers, pesticides use down"